A growing number of young people in the UK are drinking and driving, senior police officers say. People aged between 17 and 24 make up a disproportionate number of offenders and casualties in drink-driving incidents, officers told the BBC. Scotland Yard's Dave Page called for revitalised public information films to warn young people of the dangers. The government said the under-25 age group would be a big part of their summer drink-driving campaign. Supt Page said: "About a quarter of all the arrests [in London] are people between 17 and 24, which is obviously very worrying." An investigation by Radio One's Newsbeat uncovered police concern over the figures among six forces - Leicestershire, Cumbria, Metropolitan Police, Strathclyde, Northumbria and Dyfed-Powys. Leicestershire police revealed that drink-driving had risen to its highest level for a decade in England and Wales. Sgt Ivan Stafford, from the Leicestershire force, said the problem with young drink-drivers was getting worse. "They're the majority of the casualties, they're the majority of the offenders. "And the numbers of people being killed in a drink-related accident have increased dramatically. "And they're killing themselves, they're mutilating themselves, which is such a tragic waste of life." 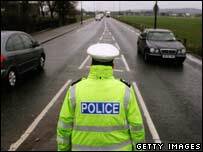 West Yorkshire's Head of Roads Policing, Inspector Russell Clark, said education about drink-driving needed to start at a young age. He told BBC News: "We need to start educating not just the drivers of today, we've got to start thinking about educating the drivers of tomorrow, the 12 and 13-year-olds who are going to be coming onto our roads in the next few years." Alyn Hopkins, whose son Domenic was killed by a drunk driver in Swansea in 2006, told Newsbeat the incident had destroyed his family. "I can't ever see my wife working again, she's totally devastated," he said. "She visits my son's grave three times a day, there's no day she doesn't go there." Carole Whittingham, from the Campaign Against Drinking and Driving, said more police were needed on the roads. "We have lost an awful lot of traffic officers over the last five of six years," she said. "There is a perception that street crime needs a higher profile so police are actually being put onto the streets rather than in their traffic cars to come across these drink-drivers."